Recipe from the Waitrose Cookery School 'Love to Cook' book. 1. Melt the butter in a large pan then add the onion and cabbage. Cook on a medium heat for 5 minutes just to gently soften, then add all the other ingredients with 100ml of cold water. Stir thoroughly and season with salt and pepper. 2. Bring to the boil, cover with a lid and cook on a low to medium heat for approx 1 hour. 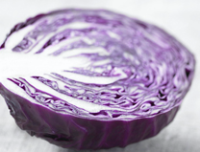 Check that the cabbage is tender by using a spoon to push against the side of the pan. If the cabbage is still tough then cover again and cook for another 10 minutes. You can now set this aside and keep warm until needed.